The Data is Conclusive: Scoliosis Bracing Works. Minsk MK, Venuti KD, Daumit GL, Sponseller PD. Effectiveness of the Rigo Cheneau versus Boston-style orthoses for adolescent idiopathic scoliosis: a retrospective study. Scoliosis Spinal Disord 2017;12:7. Mauroy JC de, Pourret S, Barral F?d?r. Immediate in-brace correction with the new Lyon brace (ARTbrace), Results of 141 consecutive patients in accordance with SRS criteria for bracing studies. Ann Phys Rehabil Med 2016;59:e32. Negrini S, Marchini G, Tessadri F. Brace technology thematic series – The Sforzesco and Sibilla braces, and the SPoRT (Symmetric, Patient oriented, Rigid, Three-dimensional, active) concept. Scoliosis 2011;6:8. Aulisa AG, Mastantuoni G, Laineri M, et al. Brace technology thematic series: the progressive action short brace (PASB). Scoliosis 2012;7:6. We want every brace we fit to a patient to make the spine as straight as possible. An ideal brace would actually “hypercorrect” the scoliosis – essentially reversing the curve in the brace. A hyper-corrective brace will not create a new scoliosis in the other direction, rather it will help bring the spine closer to a perfectly straight outcome. Enable the Patient to Wear It. 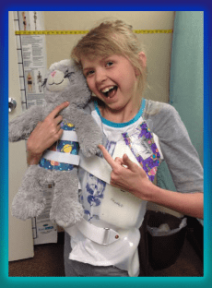 There are a lot of ways to encourage compliance in wearing a scoliosis brace, and we’ve learned a few tricks along the way. This may include spending extra time modifying the brace for comfort, coaching from the team, encouragement from peers who also wear a brace, and electronic monitoring. What is the Silicon Valley BraceTM? The Silicon Valley BraceTM is as much a method as it is a brace. The brace came into being as we searched for ways to truly capture all the corrective potential of a brace design. We couldn’t find a brace that made the spine as straight as we believed was possible and this lead to the development of a process and method that we call the Silicon Valley BraceTM. The brace is based on many good ideas that come from around the globe, as well as ideas and practices that are unique to us. The standard procedure for making a scoliosis brace is to begin with a scan or cast of the torso. From this scan or cast, a brace will be designed, fabricated, and fit to the patient. Typically no prep work is done to free up the spine prior to beginning the bracing process. Lack of pre-brace treatment usually results in a significant loss of corrective potential in a brace. The Silicon Valley Scoliosis Method aims at releasing hindrances to a straight spine, which most often are tight nerves and soft-tissue contractures. By first spending several weeks freeing the spine from the problems that bind it, the spine will be more capable of reaching a straight alignment when the brace is designed. 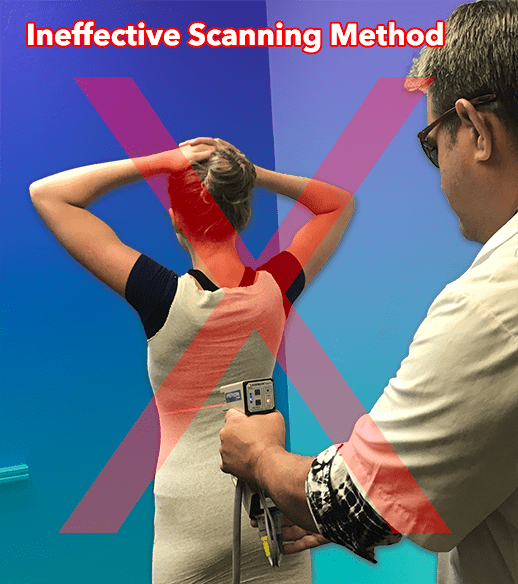 Scanning the spine with a 3D scanner is becoming more common, however, many clinicians fail to capture the full corrective potential of the curve in the scan. Typical methods end up capturing an image of the spine stuck in its scoliotic posture, which does little for capturing the full corrective potential of the spine. 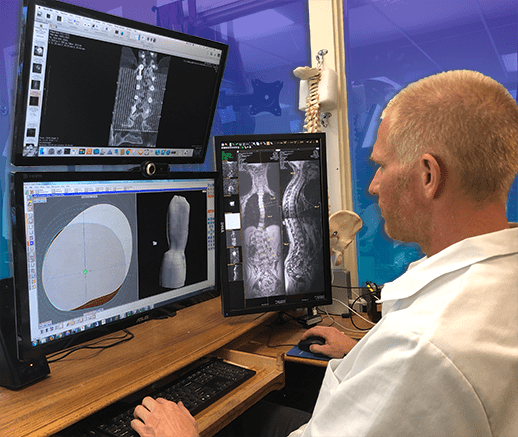 We have developed a unique 3D scan process that captures the full corrective potential of the spine, which leads to better in-brace alignment of the spine. The Silicon Valley BraceTM is designed in-house, using specialized design software, by the very clinician who has been working the closest with your case. 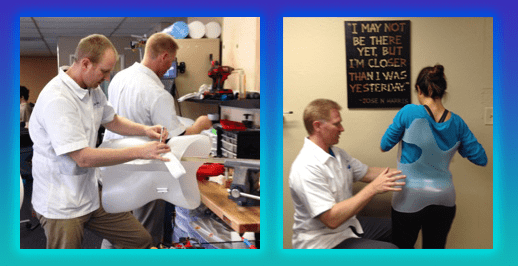 Because the person who designs the brace has already been working closely with the patient, they have a greater understanding of the patient’s curve and how to correct it. Once the brace has been designed on a computer, it is then physically manufactured in thermoplastic. At this point, the brace has a shape unique to the patient’s scoliosis, but it is nowhere near complete. The next step is to carefully sculpt the shell to match the patient’s scoliosis. Many clinics will simply throw the brace on the patient at this stage and send them on their way. Little is done to assure that the brace is correcting to its fullest potential. With the Silicon Valley BraceTM, the fitting process is a major event that spans over several days. The status-quo method to measure a brace’s effectiveness is to wait a full month after receiving the brace and then take an X-ray of the patient in the brace. The purpose of the X-ray is often just to see how well the brace is or is not working. Rarely are any changes made to the brace based on the results of the x-ray. The Silicon Valley BraceTM goes about refining a brace in a radically different way. First, rather than waiting a full month to test the brace’s effectiveness with X-ray, a standing MRI is performed right away. The MRI image of the spine in-brace is then examined to look for ways to further improve the brace fit. Changes in the brace design and fit can then immediately be made and retested with a follow-up standing MRI. Because MRI is radiation free, this “design, test, design, re-test” style process can be repeated as many times as necessary until the brace fit is perfected and the spine is as straight as possible. Brace fit almost always gets worse over time. This is a known problem with any scoliosis brace. Patients grow, muscle and fat changes shape, brace pads wear out, and the shape of scoliosis can change. All these changes will cause diminished performance of any scoliosis brace, meaning the spine is not being held as straight as it was when the brace was first made. If this process goes unnoticed then scoliosis can grow worse rather than better. For this reason, we measure the effectiveness of the brace using a standing MRI every three months. This helps assure that the brace continues to push the spine progressively straighter, rather than allowing corrective performance to diminish over time while simultaneously avoiding any harmful radiation. 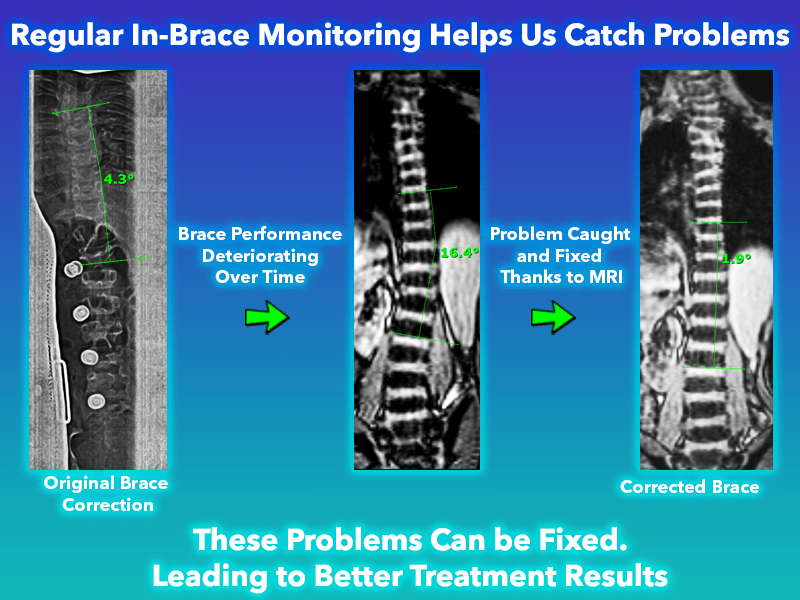 Any brace performance problems detected with standing MRI are immediately corrected, and then re-tested with standing MRI to assure perfect correction and fit. Scoliosis Care CentersTM offers 3 different styles of bracing. A 3D Silicon Valley BraceTM that is properly designed and fitted will help reduce both the bending and the twisting rotation of the scoliosis. Scoliosis Care CentersTM offers a variety of braces for different situations, outlined below. A corrective but comfortable brace that allows for all day wear, and may also be worn at night – the standard for most patients. When laying down a scoliotic spine will naturally elongate and straighten up to 33%. This fact, along with the fact that it takes less pressure to straighten a spine when there is no gravity pulling on it, allows for a more hyper-corrective brace to be worn while sleeping. A good nighttime brace is so corrective that wearing it while upright is too uncomfortable, however laying down in it will allow a comfortable fit. As long as the brace remains comfortable enough to sleep in, we can hold the spine much straighter at night than we can with a daytime brace. Smaller Sport or Reduced Profile Braces are a modified version of the Daytime 3D Brace that allows the patient a greater range of motion in a corrective pattern. Not all curve types can wear one of the Sport / Low Profile Braces but they are a great tool for patients to feel comfortable wearing a brace that is less visible and allows for more activity. Myth 1: Braces don’t work. Do back braces work for Scoliosis? Fact: A Brace CAN work, that is, a brace can help a spine grow straighter and stay straighter. Rather than begin with a philosophical debate on why a brace is good or bad, here is the clinical empirical evidence that they can work. Notice that these patients have straight spines, normal rib cages, and an apparent full range of motion. Dr. Hans Rudolf Weiss of Germany, Dr. Manuel Rigo of Spain, and Dr. Stefano Negrini of Italy have also published good findings using braces to treat scoliosis. 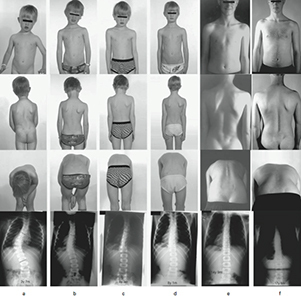 The second image to the right is a case from Dr. Weiss, published in Scoliosis. 2010; 5: 19. Published online Sep 6, 2010. Fact: Rib cage distortion occurs as a result of scoliosis, and will happen even without a brace. While some braces may worsen this distortion, other braces, like the Cheneau-style braces, reduce rib cage distortion, making the rib hump smaller. 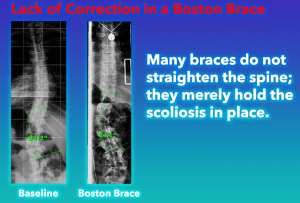 In the US and in many other developed countries, the Boston brace is the first brace of choice for scoliosis. If your child was prescribed a brace by a medical doctor, chances are it was a Boston brace. The Boston brace design is suspected of over-compressing the ribs, and doing so in a way that can actually worsen the rotational twisting of the spine, and worsening the rib hump making it more pronounced. The heavy dependency of US orthopedic surgeons on the Boston brace is probably why there exist pockets of rather vocal opposition to bracing. Most research cited by anti-brace advocates is looking at either the Boston brace or designs that are similarly compressive like the Boston brace. 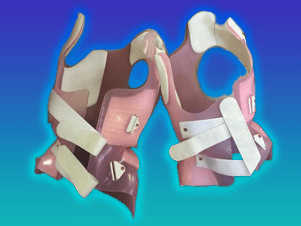 Fortunately, there are many alternative Brace designs to the Boston brace. The Cheneau Gensingen brace (aka Cheneau brace) design solves this the problem of rib cage distortion, and a well-designed and properly worn Cheneau brace will typically result in a reduced rib cage. Fact: Scoliosis becomes stiff with loss of spinal motion even without a brace. As scoliosis becomes larger in size, the spine loses its ability to exercise through its normal range of motion; the spine can no longer straighten or bend out of the curve. This loss of range of motion that occurs with every scoliosis is what leads to the stiffness of scoliosis. A brace that is ineffective in straightening the spine, especially if used without an adequate exercise program, can make this stiffness even worse. It is important to note however, that brace can only worsen the problem of stiffness, and that the root cause of the stiffness is scoliosis itself. When a brace is a part of an effective exercise program, and the treatment results in straightening of the spine, an INCREASE in spinal range of motion is observed, not a loss. The spine, because it is now straighter, is better able to exercise through its intended range of motion, and becomes more flexible. I stated earlier “nothing assures the cessation of rapid scoliosis progression like a well-designed brace that is used and worn properly”. If this statement is true, and in our clinical observation it certainly is, then nothing assures the preservation of a good spinal range of motion like a well-designed brace that is used and worn properly. In fact, this is exactly what we are seeing: Patients that reduce their curves by using bracing and exercise have also restored their normal spinal range of motion. Myth 4: Wearing a brace for scoliosis will result in weaker spinal muscles. 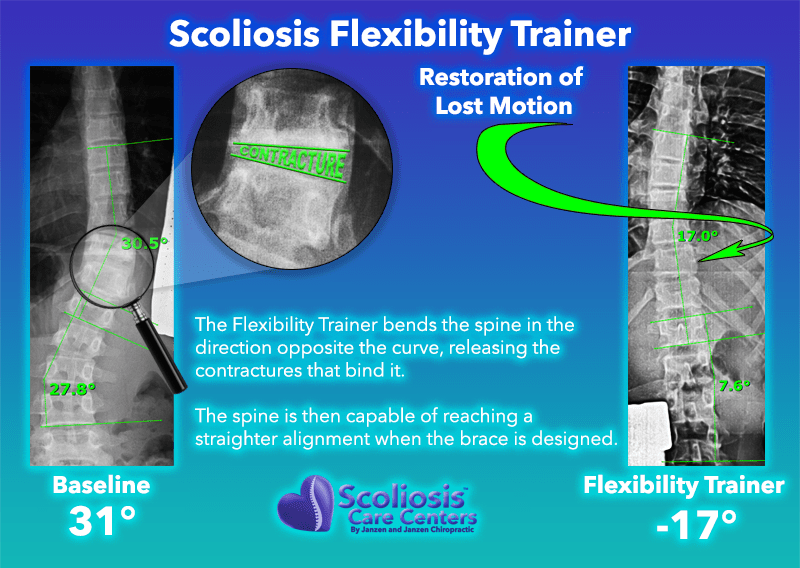 Fact: While wearing a hard brace has potential to make the muscles weak from disuse, it is possible to balance the immobilizing effect of a hard brace with an effective scoliosis exercise program, resulting in a stronger spine than when the patient first began wearing a brace. Differing brace designs can vary in how much spinal motion they do or don’t allow. On one extreme are the soft flexible braces that may allow full range of motion but provide smaller corrective force, and on the other is a full-length hard brace that provides maximum corrective input but allows little spinal motion. The bottom line in all this debate is what actually will work the most reliably to keep your child’s scoliosis from growing worse. We have seen that a well designed 3-Dimensional hard brace can be worn for 20+ hours a day, and when combined with a good spinal exercise program, results in both a straighter and a stronger spine. Myth 5: All scoliosis braces have fundamentally the same problems discussed above. Fact: Scoliosis braces vary widely in design quality and there is great variety in the skill of the specialist fitting the brace to the patient’s body. Some braces are poorly designed and improperly fit the patient’s body. Other braces, like the Rigo-Cheneau brace, have excellent design characteristics and can be highly corrective when fit by a skilled specialist. Braces may be therefore capable of having all the problems mentioned above, or capable of solving all the problems above. A well-designed 3-D brace that straightens the spine and reduces rib distortion can be a very valuable tool, especially when used in conjunction with exercises and stretches. Like many myths and misconceptions, the above statements contain elements of truth, and they reflect what can and does go wrong when using a brace, especially in the US where bracing technology lags behind that of the Europeans. So while the above statements reflect real concerns, common bracing problems can be rendered insignificant and irrelevant when a brace is designed and used correctly. What is most important to understand is, that nothing assures the cessation of rapid scoliosis progression like a well-designed brace that is used and worn properly.